Reprinted with permission from As I See It. AISI is sent free to all who request it by writing to the editor at dkutilek@juno.com. In spite of this historic and continuing debt, there has been a parallel perverse distrust and contempt toward Christian scholars (even devout and spiritually-minded ones) by much of conservative evangelical Christianity. I recall well a conversation I was party to some 25 years and more ago with an independent, fundamental Baptist pastor—a man who himself had been unable to complete even a basic, un-demanding three-year Bible institute degree, a deficiency he had not remedied by extensive personal study in succeeding years—in which he told me that “I just don’t trust men with a lot of education.” As though abject ignorance somehow made a man more spiritual and useful to God! All other things being equal—zeal, dedication, faithfulness, opportunity, personal ability—the man with the better education will do the better, more effective and more far-reaching work. Consider the case of the Apostles. All of the original twelve, as far as we can tell, apparently came from what today would be called “blue collar” occupations, rather than from the “professional” or “academic” classes (Matthew Levi, as a tax collector, may be an exception, depending on how one classifies government bureaucrats!). Peter and John were expressly described by their adversaries as uneducated and ordinary men (Acts 4:13). Even so, the Apostles did excellent work in evangelizing Jerusalem, Judea and Samaria, and to some degree further afield. But who was it that planted the gospel throughout Asia, Greece, the islands of the Mediterranean and beyond? It was the formally—and highly—educated former Pharisee and student of the learned Rabbi Gamaliel, Saul of Tarsus who became Paul the Apostle. And what was Paul’s testimony in this regard? That, by the grace of God upon him, he labored more extensively, and effectively, than the rest (I Cor. 15:9-10). It is a certainty that Paul’s extensive training in Hebrew Bible and Rabbinics were essential to his accomplishing what he accomplished, and in writing what he wrote—the doctrinal heart of the New Testament, Romans through Philemon. Reaching back to the Old Testament, let us not forget that when God brought His people out of Egypt, His chosen leader was Moses, a man educated in “all the wisdom of Egypt,” (Acts 7:22). And the leading spokesman for God during the Babylonian captivity was the man Daniel, who providentially was trained at the king’s expense in the learning and language of the Chaldeans (Dan. 1:5). In ecclesiastical history, we often see that the highly educated made contributions that greatly overshadowed the achievements of men of lesser training. Wycliffe, a university professor at Oxford, produced the first complete English Bible, which he could not have done without his mastery of Latin. All the leading Reformers in Europe, and many of the less prominent ones, were highly educated men, men thoroughly versed in Latin, Greek, often Hebrew and sometimes Aramaic and Syriac, and with a strong familiarity with both classical and Christian literature stretching back to antiquity (which constituted virtually the whole of collective “knowledge” in that era)—Luther, Calvin, Zwingli, Tyndale, Melanchthon, Beza, even Menno Simons and many more. Without their extensive knowledge of languages and literature, they could not have made their vernacular Bible translations (which gave the unlearned masses access to Divine revelation), nor written their treatises, commentaries and tracts that shook Europe, and beyond. In the following centuries, highly educated men were the leaders in Christianity. Some were formally trained—the men of the Westminster Assembly, the Puritans in general, John and Charles Wesley, George Whitefield, Jonathan Edwards, Adoniram Judson—while others, lacking “higher education,” were self-taught: John Gill, William Carey (who never spent a day in college, yet mastered numerous languages and was in his day acknowledged as the world’s greatest living linguist), and Spurgeon, to note only a few. And even men who began with essentially no education at all nevertheless saw the need to inform their minds in preparation for God’s service—John Newton (the converted slaver who studied Latin and Greek after entering the ministry), D. L. Moody and Gipsy Smith to list some few obvious examples. None of these men decried learning and learned men, but valued their own education and prized what other men’s minds had made available to them through their writings. The truth be told, Christian scholars of the 19th and previous centuries were as a class far better educated individually than today’s scholars. Consider Henry Alford’s famous commentary in 4 volumes, The Greek Testament. Published in the 1860s, it regularly quotes various texts and authors in Latin, Greek, German, French and other languages, with the unspoken assumption that of course his readers had no need of translation of any of these. That we collectively fall far short of the achievements of earlier generations of Christian scholars is to our great loss, and embarrassment. Our need is not for fewer scholars today—we very much need many more than we have. 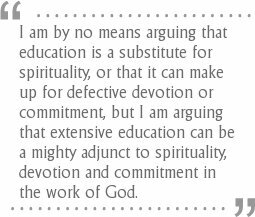 I am by no means arguing that education is a substitute for spirituality, or that it can make up for defective devotion or commitment, but I am arguing that extensive education can be a mighty adjunct to spirituality, devotion and commitment in the work of God, and we are desperately in need of a continually-maturing “crop” of new Fundamentalist scholars, if we are to do the work of the ministry as effectively as we ought in this and future generations. Education is not an end in itself, but a means to a very important end. Neither ignorance nor intellectualism . . . . .
And I baptized also the household of Stephanas: besides, I know not whether I baptized any other. For Christ sent me not to baptize, but to preach the gospel: not with wisdom of words, lest the cross of Christ should be made of none effect. For the preaching of the cross is to them that perish foolishness; but unto us which are saved it is the power of God. For it is written, I will destroy the wisdom of the wise, and will bring to nothing the understanding of the prudent. Where is the wise? where is the scribe? where is the disputer of this world? hath not God made foolish the wisdom of this world? For after that in the wisdom of God the world by wisdom knew not God, it pleased God by the foolishness of preaching to save them that believe. For the Jews require a sign, and the Greeks seek after wisdom: But we preach Christ crucified, unto the Jews a stumblingblock, and unto the Greeks foolishness; But unto them which are called, both Jews and Greeks, Christ the power of God, and the wisdom of God. Because the foolishness of God is wiser than men; and the weakness of God is stronger than men. For ye see your calling, brethren, how that not many wise men after the flesh, not many mighty, not many noble, are called: But God hath chosen the foolish things of the world to confound the wise; and God hath chosen the weak things of the world to confound the things which are mighty; And base things of the world, and things which are despised, hath God chosen, yea, and things which are not, to bring to nought things that are: That no flesh should glory in his presence. But of him are ye in Christ Jesus, who of God is made unto us wisdom, and righteousness, and sanctification, and redemption: That, according as it is written, He that glorieth, let him glory in the Lord. As an educator, I am no proponent of ignorance or stupidity but many times, I find certain brethren enamored with intellectualism. It seems that we desire the approval and respect of the secular world to the extent that we seek to win their favor by exhibiting such qualities as would meet their expectations and earn their applause. BTW, intellectualism is not synonymous with being intellectual or living the life of the mind. It is a "wannabe" spirit that pretends to the posturing and acting out of elitist poses, the pursuing of degrees (not necessarily the pursuit of learning), and faith in a rationalistic scholarship. Education and scholarship are too often promoted as virtues more than faith, holiness, and righteousness. Having suffered the sneers of an increasingly sophisticated society, Fundamentalists seem intent on redeeming themselves through education, scholarship, and intellectualism. This intellectualism often brings pride. One begins to feel as if he has arrived and is superior to other men. He trusts his own mind to judge all things including the spiritual. He is self-sufficient and becomes puffed up. As a scholar, he is interested in maintaining his respectability in academia. He is estranged from other common or less educated believers who may become suspicious of him. It is true that some Fundamentalists are suspicious of education. Could it be that this is a residual attitude from the Fundamentalist-Modernist controversy when Modernism, evolution, skepticism, etc were taught and transmitted through the schools, colleges, and universities? It is true that many young people lost their faith upon exposure to these ideas during their education. Furthermore, it is not just modern Fundamentalists who think their can erase their stigma through education but the general prevailing American attitude is that education the path upward. And it has been generally true in past generations but it may be no longer the case as education approaches almost universal proportions. Five thousand doctorates are wheeling taxicabs. In sum, although I support education and learning, I do not think that education and scholarship is the redemption of Fundamentalism. Nuff said. Challenging Erasmus . . . . .
Contra Erasmus, it could be said that scholarship has generated as many or more heresies than it has refuted. Could someone please tell me what "Christian Scholarship" is? How is it different in essence from plain, ordinary, secular scholarship? What are the bounds? Is Roman Catholic scholarship "Christian Scholarship?" Seventh Day Adventist? Basically, we need to recognize the inherent weaknesses of extremes. Those who give too much credence to scholarship on the one end, and those who reject education on the other. I see Bro. Kutilek's point- it's a valid concern. But phrases like this concern me- "In ecclesiastical history, we often see that the highly educated made contributions that greatly overshadowed the achievements of men of lesser training." Oh really? Achievements by whose definition? Keeping track on the Fundy scoreboard has never brought about anything but Trouble, with a capital T and that rhymes with P and that stands for Pompous Blowhard. I venture to say that the reason God allows some men to achieve great things is that they have a humble spirit- which was Moses' main claim to fame- Numbers 12:3. When God chooses to honor someone, it is never for their intellect, it is for their God-honoring servant's heart. And what about Solomon? Would any of us consider him qualified to teach in our churches? Jeremiah 9:23-24 Thus saith the LORD, Let not the wise man glory in his wisdom, neither let the mighty man glory in his might, let not the rich man glory in his riches: But let him that glorieth glory in this, that he understandeth and knoweth me, that I am the LORD which exercise lovingkindness, judgment, and righteousness, in the earth: for in these things I delight, saith the LORD. It isn't the wisdom or riches that is the problem; it is when man glories in his possessions or abilities, and gives those things credit instead of the Lord, without Whom we would not have the sense to tie our own shoes. We should always seek knowledge, wisdom, and understanding- but in ways that bring honor to God, not to ourselves. We should not use knowledge as a weapon, to manipulate and dominate, but to nurture and sustain. In the context of the passage in 1 Cor. 1, you can see the reason God uses simple things to confound- vs. 29 That no flesh should glory in his presence. Which is an excellent reason, IMO, for our Fundy scholars to be very, very careful in how they listen to those who have not received the level of education they have. Before honor, humility. (Prov. 15:33, 18:12, 22:4) But 1 Cor. 1 is not an excuse to remain ignorant, any more than James 2:5 is a reason not to further one's career and pay one's bills, which is how it is often used, and is just as shameful as elitism. It is scholarship conducted within the bounds of Christian beliefs. "Christian beliefs" are shared in varying degrees by the groups you mentioned. I appreciate Doug's work on this. We need to get over our fear of the intellect and the tendency to assume that other capacities of the inner man are more trustworthy or that somehow ignorance and not thinking are more godly than information and reflection. I appreciate the article....and see positives and negatives. Because our Bible colleges and seminaries cast a wide net ang bring in all sorts of people, there are those that are raised up who have the ability to be theologians. However, just because one has the skill to be a Christian scholar doesn't mean it is the right thing. First of all, it doesn't guarantee one of the most practical outworkings - a job. I know a young man who is eminently skilled and qualified in all the Biblical languages, and in fact is working on a Ph.D., but is a bus driver to make ends meet. He was out of a job completely for a couple of years after pastoring for several years. If anything, some of the Christian higher-level institutions may cause young men who are impressionable to want to be Christian scholars to aspire to it too much. There is not that much of a market for it. Beyond that, there is the Bible warning that "knowledge puffs up". There can easily become a sort of "intellectual elitism" that can form in the mind of a Christian young person. We've seen young people be trained in the disciplines of Christian scholarship and discover they can make more money being a lawyer or in different theological or denominational circles. While I'm sympathetic to the cause that is written about, we seem to be having more trouble producing pastors, missionaries, etc. at this time. These men also need to raise their level of scholarship in the world we live in today! And what about Solomon? Would any of us consider him qualified to teach in our churches? The comparison I was making is that Solomon was the wisest man who ever lived, and yet I doubt any Fundy church would let him (if he were alive today) speak- he was known for his excesses as much as his intellect. Even in the OT economy, it's hard not to notice the number of wives and concubines and ask "What was he thinking?" http://www.freesmileys.org/smileys.php ][img ]http://www.freesmileys.org/smileys/smiley-confused002.gif[/img ] We may enjoy the accumulated and preserved wisdom of Solomon, but we'd never forgive him personally, regardless of his intellectual mastery. We simply have to keep scholarship in balance with the proper focus, and that is on what we do to bring glory to God, to serve His purpose, and benefit others. I enjoy brainy talk as much as the next armchair scholar, but there are times when I wonder how often some of these PhDs go preach in jails, counsel couples that have been shacking up, minister to drug addicts and alcoholics, help parents with wayward children, visit in hospitals... Knowledge not applied is useless, and if it is only applied to publish books, be looked on as an expert, and feel impressed with oneself, then that person is about as useful as last year's litterbox. Could someone please tell me what "Christian Scholarship" is? I don't think "Christian scholarship" is necessarily distinct in essence (content, methodology, etc. ), but scholastic knowledge is processed and applied differently from a Christian perspective. I wrote an SI http://sharperiron.org/2007/09/28/christian-curiosity ]article along a similar vein a few years ago. There is no class of people meaningfully referred to as "PhDs." A PhD is an academic qualification, not a status or vocation. If you meant to refer to scholars, why should scholars do any of those things? They could, of course, and that would be fantastic; but there is no reason to insist that they do so. For better or worse, a scholar is not a minister and does not have the duties of a minister. A minister is usually not a scholar. Scholar and minister are vocations; they have separate realms, just as plumber and electrician, or scientist and engineer. If a person is both a minister and a scholar, they have two separate careers, just as if a plumber did electrical work on the side. When doing so, he isn't plumbing. Scholarship - the reception, accumulation, and transmission of Intellect - is useful regardless of what other activities the scholar performs. His or her work allows others to think better, to carry out tasks better, or both. The man who composes an accurate Hebrew lexicon does a service to the Christian community, whether or not he ever preaches - whether or not he is even a Christian. Without scholarship, the Christian community lacks the resources to make informed decisions. Someone has to produce the knowledge that everyone else wants to use. In fact, many of the best scholars are those whose work is not carried out in the service of a particular ideological or ecclesiastical banner. The notion that scholars and educators should focus their work on improving the world (whether in a Christian or secular manner) distorts scholarship into agenda. Education is not meant to make people better or more holy; it focuses on making them more effective (see John Henry Newman, The Idea of a University) in their endeavors. My contention, then, and I suspect Doug's as well, is not that Christians have a universal call to be scholars, but that scholarship is a necessary vocation within Christianity, one that ought not be despised or resented. The attitude of resentment, though somewhat visible in all cultures, is pronounced in democratic ones. From the fact of universal suffrage, men and women conclude that they have all the intellectual resources they need to make good decisions. From the toleration of divergent opinions is inferred the equality of those opinions. The pursuit of intellect is suspect, for why pursue something everyone already possesses? The man of action - the practical man, the hero of the democracy - is exalted. Doug's point that scholars have had a numerically disproportionate influence on Christianity is fact. A vocation aimed at the production and dissemination of knowledge necessarily multiplies influence. The same is true for public officials, military commanders, and upper-level management at large corporations. The fact that all people are not equal in influence says nothing about their intrinsic value, but that is difficult to grasp in a mobile society. When social classes were fixed, the peasant did not fault himself that he was not royalty, nor did the merchant think that his lack of nobility reflected poorly on his character. In our mobile society, people are made to feel as though they must succeed at becoming intellectual. The fact that my classmate became an influential politician and I did not means that his life choices were better than mine. Influence is viewed as a duty, and a lack of influence is failure. This explains why Americans both revere and resent politicians and scholars - they have achieved a sort of success that the rest did not. As long as that mindset, inherited from our culture, persists in the church, there will be no healthy use of Christian scholarship. Non-intellectuals will treat intellectuals with suspicion, and the intellectuals will respond by closing ranks and becoming ever more insular. The only way out is a robust conception of calling, the understanding that some people are called to produce information and other people are not. Scholars should be judged by the standard of scholarship, and non-scholars should not think that they must somehow compete intellectually with scholars. If we fail to regard the diversity of calling, we will end up (and in some ecclesiastical circles, have ended up) back in the Middle Ages, where the monk was the icon of the true Christian life, and everyone else felt guilty about not being more monk-like. The context of this topic assumes that we are talking about Christians. Obeying Scriptural mandates is paramount for every Christian, be they a plumber or a PhD. No one gets excused from ministering to real live people because their vocation is to study, research, and publish. Obviously, scholarship is valuable, and by no means am I diminishing that- but Christian service to the body of Christ and the lost is not a vocation, it is a command. There are no blue collar or white collar Christians- we should all be in the trenches. Who would you trust more to perform an operation- someone who has read about and researched surgery thoroughly, or someone who has not only received education and training in the field, but has performed hundreds of successful surgeries? That is how I personally view scholarship- it is only as valuable as what has been put to actual real life use. Missing the point . . . . Your definition sounds kosher, but what does it mean? My point is that we throw around the word Christian as a buzzword for its feel good effect, not some substantive meaning. What are the bounds of "Christian beliefs." On the one hand, this would seem to include the RC's, Seventh Day Adventists, etc. I'm sure that they would say their doctrines are within the bounds. So, I am questioning whether the idea of "Christian Scholarship" has merit if we cannot define the bounds of what it is and what it is not. Why must we attach Christian to everything and have our own directory of Christian businesses, Christian publishers, Christian massage salons, etc. Perhaps we are overly commercializing the term. Are we using it for our subversive purposes? Do we think that it brings credibility to our activity? Is Christian XYZ of a different essence than plain XYZ? I really don't see the justification. Have you read Harry Blamires' The Christian Mind: How Should a Christian Think? What did you think of it? No one is denying that Christians have moral duties outside their vocations. What I am denying is that we can judge the value of people's vocational work by their extra-vocational activities. All of the items you mentioned - "preach in jails, counsel couples that have been shacking up, minister to drug addicts and alcoholics, help parents with wayward children, visit in hospitals" - are things that ministers do vocationally. Some of them can be done in an unofficial capacity by laymen, of course, but that's beside the point. If a plumber preaches in a jail once a month, that doesn't make him any better or worse as a plumber. So, it's entirely inappropriate to judge the value of a person's scholarship by his service in the church. This is a confusion of categories. Scholars are not professionals, and they do not teach technical skills. Doctors, lawyers, and ministers are not scholars; they are professionals (or are treated as such). As medicine terminates in health and ministry terminates in discipleship, scholarship terminates in knowledge. It is by definition not praxis, and cannot be judged by some supposed practical results. Scholars (should) aim only at providing knowledge; they can't (shouldn't) tell you what to do with it. It isn't irrelevant- I understand the aim of the scholar as a vocation in and of itself- but in the realm of Christian scholarship, I expect a certain amount of putting one's ministerial studies to the test with some actual ministering. This isn't about a plumber being a better plumber because he preached in a jail, but about a theologian practicing good theology by obeying Christ's commands to be involved in various aspects of ministering. I value study and scholarship, probably more than you realize- but I'm advocating for a balance of the theoretical and practical, not any sort of advantage of one over the other. They should, IMO, go hand in hand. My point is that we throw around the word Christian as a buzzword for its feel good effect, not some substantive meaning. What are the bounds of "Christian beliefs." On the one hand, this would seem to include the RC's, Seventh Day Adventists, etc. I'm sure that they would say their doctrines are within the bounds. The label "Christian" is applied to way too many things in a way to somehow bless them. I would go even farther than RPittman. I think we use the label "Christian" to legitimize work and products that are of a substandard quality. "Christian" is attached far too often to sub-par products and sloppy thinking in order to give them recognition. But to answer your original question "What is 'Christian Scholarship'? ", I would simply say that it's research done based upon Biblical premises. "Christian Scholarship" is/should be no different from secular scholarship except that it has a different set of presuppositions. Now of course those differing presuppositions will have ramifications that make "Christian" scholarship different than secular, but from the human perspective it's no different than the differences between the scholarships of an atheist, an agnostic, and a muslim. You're still confusing categories. Ministerial studies isn't scholarship and isn't designed to produce scholars. It's vocational training for the ordained ministry. You can, quite rightly, judge the quality of ministerial studies by ministry performed, just as you can judge the benefit of medical training by medical practice. You cannot, however, judge the quality of scholarship by anything other than the work produced. It has no other end. Scholarship doesn't teach people how to do anything, so it can't be confirmed or denied by the performance of a skill. There is no such thing as "practical experience" for a scholar. The man working in hypothetical mathematics doesn't have to invent or design things to justify his research. The distinction between scholarship and vocational training has been made here previously by Kevin Bauder in his http://www.sharperiron.org/2008/01/08/fundamentalists-and-scholarship-pa... articles on Fundamentalists and scholarship. I think what you are arguing is that those involved in vocational training ought to demonstrate competence in their vocations. I agree wholeheartedly. The goal of training is the effective performance of a skill. The goal of scholarship has no relation to performing skills. Scholars "do" nothing and teach others to "do" nothing, though their ideas may issue in actions. With any other vocation, I'd completely agree with you. The difference I see is that in "Christian scholarship" one (meaning 'me') can't separate the two terms- I can't fathom a 'non-practicing Christian' (for lack of a better term at the moment) producing quality Christian scholarship. Perhaps that's just blockheadedness on my part, but no matter how I slice it, it still comes up peanuts. How does knowledge of Scripture terminate at that point in the life of a believing scholar? Charlie & Susan... missing eachother I think. I'll take a shot at explaining you to eachother... and probably get both wrong! If I understand Susan's point (not sure I do), it's that the pursuit of study of something shouldn't result in neglect of the business of Christian living. Susan, maybe you're also saying that the "Christian scholar" has responsibility to be more active in Christian service than, say the "Christian electrician"? That's an interesting idea. I'm not sure off hand why that would be the case but also don't know of any strong reason why not. I think what Charlie's getting at is that scholarship as a vocation is something a Christian pursues in a Christian way, but it's chief value is in the work itself not as a means to enabling something else like vocational ministry. So I think he's saying that a Christian scholar does not have responsibility to be more active in "ministry" than a Christian dry cleaner. I'm not sure what your point here is. Are you claiming that there is no such thing as Christian scholarship? As for the rest, of course, everything a Christian does, if he's obedient, is profoundly different from everything an unbeliever does in particular ways--and exactly the same in others. Chiefly, we have a completely different ultimate goal for everything we do. That alone warrants attaching "Christian" to it. A close second is that we have a completely different idea of what everything we do means. But on top of these reasons, since scholarship is so interested in ideas, it would be silly to pretend Christian scholarship is the same as non-Christian or go out of our way to drop "Christian" from our descriptions of it. He is quoted as saying "To think secularly is to think within a frame of reference bounded by the limits of our life here on earth: it is to keep one's calculations rooted in this-worldly criteria. To think christianly is to accept all things with the mind as related, directly or indirectly, to man's eternal destiny as the redeemed and chosen child of God." Sounds like I would not disagree with much he has to say. George Marsden wrote Jonathan Edwards: A Life. What actions does he have to perform to justify my regarding that as useful scholarship? I think that part of my problem is that the activities you listed that supposedly qualify the scholar are all ministerial duties. A scholar does not have ministerial duties, and may not be qualified for them. When you speak of Christian scholars, are you thinking specifically of theologians and biblical exegetes? I'm not, though I acknowledge that in their cases, the relationship between church and work may become significantly more intertwined. You were the one hiding the Universal Translator. Shoulda' known. A couple of words I think are tripping us up- minister and ministerial. Every Christian should minister according to their gifts, abilities, opportunities... but pastors/teachers/ordained ministers are called to a specific Biblical function of teaching and leadership. So I agree that a scholar is not also by default called to be a minister, but if he is a Christian (and I'm going to assume the Christian scholar is, in fact, a Christian), he is called to put into practice what he knows is right. George Marsden wrote Jonathan Edwards: A Life. What actions does he have to perform to justify my regarding that as useful scholarship? Interesting question, because my first thought is that we always look at credentials, don't we? I mean, why is he qualified as a historian, why should we consider him a source of accurate information, why do we trust him? Thanks for the discussion above. It has helped me to think a bit more clearly about the distinction between a scholar and minister. As I was reading the thread, the example of my own pastor came to mind. He trained to be a scholar (earning his D.Phil in ecclesiastical history) and intended to teach church history at a seminary. Shortly before taking up that position, he accepted the call from our congregation and has since spent 15 years as a minister. I expect his investment in the kingdom today looks different (not to say better or worse) than it would have had he pursued that career in scholarship. As a side note: Charlie, I've enjoyed your series on the Confessions. I began to read and comment along, but quickly fell behind due to a job change. Still, I read your thoughts each time I finish a book. Thanks for making that available. I just finished one of Piper's newest books: "Think: The Life of the Mind and the Love of God. It dealt heavily with this topic and would be a relevant read for anyone wanting to delve into this area more. He makes a good case for Christian scholarship within the confines of humility and surprise: the glory of God. Well, I think where this starts to break down is in a couple of areas: one, the kind of knowledge involved. If you become a scholar in Ancient Near East studies, for example, you know tons and tons about what all those "ites" said and did, but though this is knowledge that helps in understanding of Scripture it is not really knowledge that is directly related to spiritual maturity or ministry skill. Same would be true of, say, a high level of expertise in languages. Useful in the overall mix, but a guy who knows how to read Cuneiform is not going to be "responsible" to be godlier than a guy who doesn't. Secondly, knowledge is only one factor in maturity. So much has to do with the affections and with spiritual habits. So, though knowledge is a big factor ("grow in grace and in the knowledge of our Lord...") it isn't the direct cause of maturity, which has to do with the combination of the word of God, people of God and Spirit of God in a person's life as God graciously molds him. I am arguing that extensive education can be a mighty adjunct to spirituality, devotion and commitment in the work of God, and we are desperately in need of a continually-maturing “crop” of new Fundamentalist scholars, if we are to do the work of the ministry as effectively as we ought in this and future generations. Education is not an end in itself, but a means to a very important end. With the OP in mind, if you backtrack my posts, I think you might see why they contain certain assumptions and conclusions. You're right, Susan. Other than Erasmus, all the examples given are not scholars in the modern sense, but rather educated professionals or spiritual leaders. Scholarship as an activity independent of ecclesiastical or other ties is a relatively new phenomenon, so it remains to be seen whether those examples serve as prototypes of modern scholars or are actually what he's intending to communicate. If he's simply arguing that Christians should value education, bravo, but my interest has diminished greatly. It means something or it means nothing . . . . . Regarding the term Christian in a slightly different context, C. S. Lewis said the word must mean something or it meant nothing. This is my argument. Let's not trivialize a good word. It seems that you are arguing if a Christian man is a doctor then he practices Christian medicine. There is a difference, I think, between saying that he practices Christian medicine and saying that he practices medicine as a Christian. There is a difference, I think, between saying that he practices Christian medicine and saying that he practices medicine as a Christian. I think that was part of the trouble with Bro. Charlie and I- there is pure scholarship as a vocation chosen by a Christian, and in that sense the Christian part is sort of incidental, hence the references to dry cleaner and plumbers who are Christians. Then there's Christian scholarship in the sense that Bro. Kutilek is proposing, the "specific areas of study... for a budding young scholar-in-training who wishes to maximize his usefulness in the service of God". "I know a young man who is eminently skilled and qualified in all the Biblical languages, and in fact is working on a Ph.D., but is a bus driver to make ends meet. He was out of a job completely for a couple of years after pastoring for several years. If anything, some of the Christian higher-level institutions may cause young men who are impressionable to want to be Christian scholars to aspire to it too much. There is not that much of a market for it." In this economy, having a bus driver job is a blessing and should in no ways be despised. Incidentally, the very learned apostle Paul at times had to support himself by making tents. Sewing dead animal furs together and making tents. This man was AN APOSTLE who did most of the heavy theological writing - was responsible for a great deal of the intellectual heavy lifting - in the New Testament. And at times he had to support himself by curing the skins and furs of dead animals and sewing them together to make TENTS. So, in that sense, what on earth is wrong with being a bus driver? Also, you have a lot of our missionaries and pastors overseas who have to support themselves with "common, regular jobs" that would make being a bus driver in America seem like ivory tower royalty. I would rather have one guy like this, who has such a love and heart for deep study in things regarding the Word of God and is willing to sacrifice his standard of living and the comfort and prestige of this world in order to pursue his first love, than a million pastors who reference popular (often vulgar!) movies and songs in their sermons and send tweets from their I-Pads from their pulpits during church services in some attempt to be "relevant." If this guy had been made so "puffed up" by intellectualism, would he be a bus driver? Seems to me that a puffed up sort would be a purpose-driven church growth expert. I say let this guy have his intellectual pursuits now, and it may well pay off with a much better grounded and prepared full time pastor down the line. Bus driver gaining intellectual depth and humbling life experience through hard work, or purpose driven your best life now preacher boy? I choose the former. I think the difference is not as large as it may seem. Didn't Paul tell the "slaves" in Colossae that they were do do their labor as to the Lord and not men? My point is that for a disciple of Jesus Christ, pipe fitting is "the service of God." So a vocational scholar who doesn't necessarily "serve" in more overtly churchy sort of way than an architect or a landscaper is not necessarily an anomaly or missing the mark somehow. Why must we attach Christian to everything and have our own directory of Christian businesses, Christian publishers, Christian massage salons, etc. Perhaps we are overly commercializing the term. Are we using it for our subversive purposes? Do we think that it brings credibility to our activity? I think the trend RPittman was addressing is attempting to use the term 'Christian' as a marketing tool, not just doing one's labor as unto the Lord. I would expect Christian plumbers to do their best work and charge a reasonable price because they are a Christian and should hold themselves to a higher standard... but I have to say that I expect that of everyone I do business with... so it isn't a particularly 'Christian-y' ethic as much as a good business practice for anyone who expects to increase their customer base. Whether or not they are working 'as unto the Lord' isn't something I would feel comfortable trying to discern. I think the question of what is meant by "Christian scholarship" is fair, but I also think the article defines it as educating oneself for the work of the ministry, and since Bro. Kutilek is writing for a particular audience, I think we (and he) can take the definition of 'Christian' for granted- he is obviously not writing to or about JWs or Catholics. It also seems that he is not referring to a Christian engaging in scholarship as a specialized vocation- and Pt. 2 fleshes this out more.